Always a sad time of the year when the peonies are done blooming…especially Candy Stripe! Candy Stripe’s unique bloom color continues to amaze us not only as a garden peony, but also in a vase. 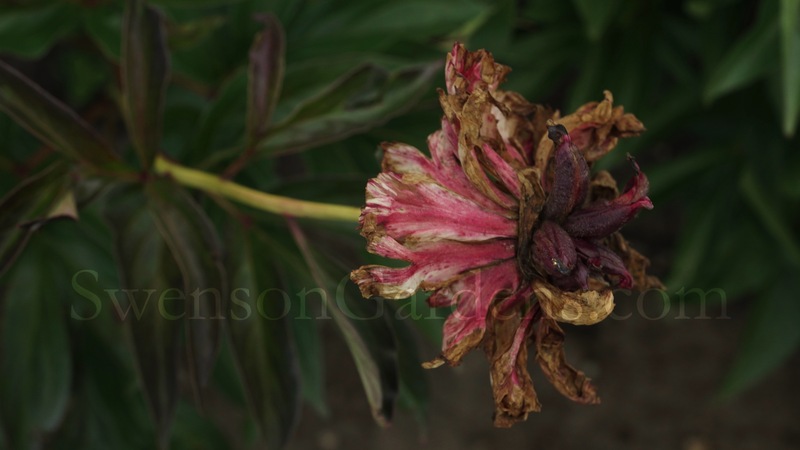 Though the photo below was taken at the end of its bloom time, the photo on our homepage in ‘Gardens’ is Candy Stripe. 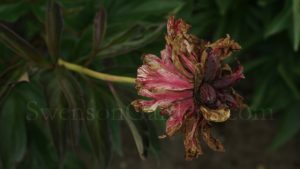 As our current leader of the most popular peony sold in 2017, its mid to late bloom time and wonderful foliage positions itself in garden beds not only in clump plantings but also as an accent plant. If you haven’t planted Candy Stripe before, now is the time to consider it as another wonderful Swenson Gardens peonies! Lots of activity around our four Purple Martin houses on the peony farm! My oh my how mom and dad are very busy trying to keep their young ones nourished. We are estimating our clutch count at 140 to 150 chicks. I didn’t want to check all the houses as tonight a rather loud chick was crying out for more food! Must be the dominant chick as mom and dad tried to push him out of the way in order to feed the rest of them. This chick smiled at me while I was taking this photo perhaps thinking I had a nice plump insect to share? I didn’t open this nest up for fear of it falling out. On to a couple other nest boxes and the crew of chicks were not as boisterous. In fact they were rather timid and/or in some cases sound asleep. Three of our Purple Martin houses have a boat winch on them so it is easy to raise and lower them. This was the last check in the nest boxes as the closer they get to flying the more protective mom and dad are of their young ones. Needless to say Redd did not accompany me as he doesn’t go near the houses as mom and dad tend to dive bomb him. Fun to watch but poor Redd seems to be looking up more as he walks down the driveway. I’m assuming flight lessons will be starting in a week or two. Always fun to watch the young ones land for the first time. 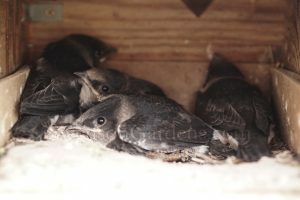 The sounds of Purple Martins will be extremely loud until the young ones master flights and landings. 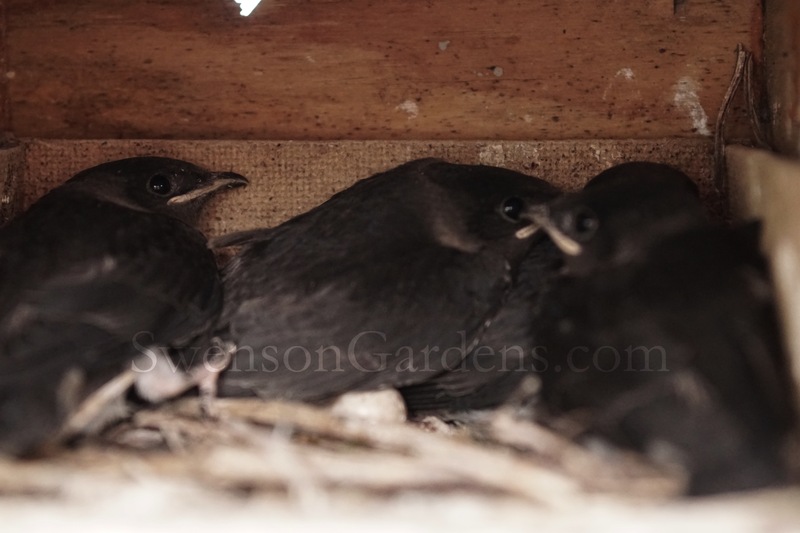 When its time to fly, mom and/or dad will get into the nest boxes and push them out. Amazing to see this happen and hopefully the Sony will be ready! 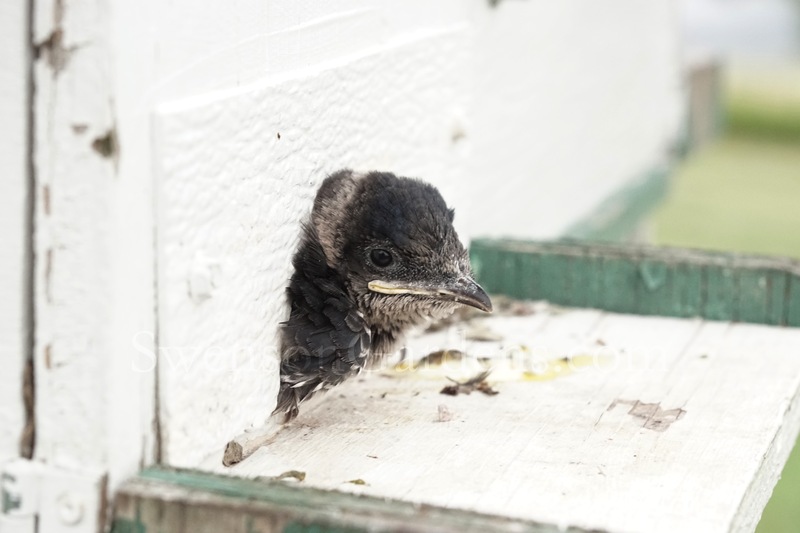 Life on the peony farm…you got to love it…especially when the Purple Martin chicks start to fly!